Splurge on the Luxurious Side of International Drive! We all need some well-deserved pampering and splurging on a few luxurious treats on vacation and the International Drive Resort Area has it all: World class accommodations, soothing spas, elegant dining, great shopping, golfing and special tours fit for a VIP: YOU!!! Check out these suggestions to treat yourself to the best of the best in the world’s most famous vacation destination! For visitors who want to feel indulged, pampered, spoiled, there are great choices of upscale properties that are pulling out all the stops in preparation for your arrival. With so many amenities to pamper you during your visit, you may never want to leave your hotel! Accessible to all of the area's top attractions, Hyatt Regency Orlando warmly welcomes guests with luxurious accommodations and attentive customer service. Guests enjoy the zero-entry Grotto Pool with a slide and interactive water feature or an Olympic-size terrace pool, each with a children’s pool and a Jacuzzi hot tub. With amenities that include Along with The Spa, a 22,000-square-foot, full-service spa, salon and fitness center and status as a national landmark hotel in the meetings and conventions industry, the property offers 1,641 elegantly appointed guestrooms, including 193 sophisticated suites and available pet-friendly rooms. orlando.regency.hyatt.com 407-284-1234. A grand hotel in the tradition of Florida’s turn-of-the-century resorts, the conservation-minded property encompasses the historic Shingle Creek, headwaters of the Florida Everglades. One of the area’s most elegant properties, the hotel is situated on 230 acres of lush landscape. The resort offers lavish choices in accommodations, enticing restaurants, rejuvenating spa. The championship golf course, an 18-hole, par 72 course was named one of Central Florida's Top 10 Toughest Courses and the Brad Brewer Golf Academy, offering lessons from Golf Channel favorite and Top 100 instructor Brad Brewer. The day spa and elite salon offer an impressive list of personalized body treatments, while the hotel's 12 dining/lounging options include the classic AAA Four-Diamond steakhouse, A Land Remembered. Hotel owner, Harris Rosen, is well known for his philanthropic passions and green lodging practices. rosenshinglecreek.com 407-996-9939. The elegant Hilton Orlando, adjacent to the Orange County Convention Center features two pools, a lazy river; steak and chop house, spa and 9-hole putting course. www.thehiltonorlando.com 407-313-4300. Located near SeaWorld, Universal and close proximity to Pointe Orlando, across from the Orange County Convention Center. Spacious and elegant studios, 1-, and 2-bedroom suites offer nicely equipped kitchenettes or full kitchens and spacious living areas complemented by exception on-site amenities. www3.hilton.com 407-233-2200. Dive in and discover this stunning resort hotel that boasts a prime location across from SeaWorld Orlando and near Aquatica, Discovery Cove and Universal Studios. 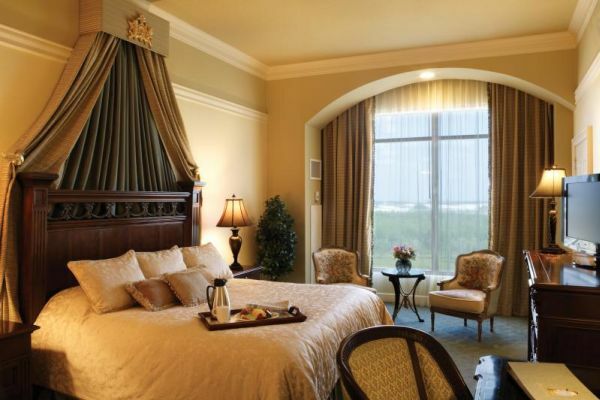 This Four-Diamond property offers 778 large, beautifully appointed rooms and suites. Adjacent to SeaWorld and Discovery Cove, it boasts a gilded Venetian aviary, fine-dining restaurant, Atlantis; Olympic-size swimming pool, and four tennis courts. www.renaissanceseaworld.com 407-351-5555. Unplug and escape to the spa! The classic and elegant Spa at Shingle Creek Orlando is part of the luxurious Rosen Shingle Creek Hotel. Guests relax and rejuvenate in style with treatments that include mud wraps, soothing massages, signature facials and more. A sleek fitness studio overlooks scenic views. A swim in the invigorating pool or an afternoon of total mind and body relaxation are available at this day spa and salon. www.spaatshinglecreek.com 407-996-9SPA. The Mandara Spa at the Portofino Bay Hotel, an 8,000-square-foot relaxation center at Universal Orlando Resort, offers guests an exotic spa experience rooted in Balinese healing traditions passed from generation to generation. The world-class spa provides exotic therapies that reflect the beauty, spirit and traditions of both Eastern and Western cultures. Here the highly skilled therapists prepare beauty therapies fresh each day using actual spices, fruits, vegetables, honey, yogurt, seaweed, salt, minerals and other real ingredients and creating the treatments just as they have been done in Asia for centuries. www.mandaraspa.com 407-503-1244. The Arnold Palmer-redesigned course at the award-winning Shingle Creek Golf Club, is located east of Orlando's Orange County Convention Center at the Rosen Shingle Creek Hotel. A course layout that is challenging and flexible enough to test your skills will not frustrate the less experienced player! This is a beautiful course not to be missed! www.shinglecreekgolf.com 1-866-996-9933. Luxury shopping at a savings! With specialty shops (Victoria Secret, Tommy Bahama and more) and restaurants you can have lunch, shop, see a movie, shop some more! Enjoy an evening at B.B. Kings Blues Club. Dine at Cuba Libre Restaurant & Rum Bar or Oceanaire Seafood Room. www.pointeorlando.com 407-248-2838.